During this year’s EvoLang conference, a book was launched with perspectives on the last conference. The past, present and future of language evolution research (McCrohon, Thompson, Verhoef & Yamauchi, 2014) is a volume of student responses to EvoLang9 in Kyoto. It includes basic reviews and criticism, synthesis of current approaches, experiments and sociological perspectives. It makes for interesting reading. What comes across in all the papers is a drive for collaboration and integration of fields and ideas, as the diagram from the contribution by Barcceló-Coblijn and Martin shows. These are serious attempts to understand what has been learned so far and find new perspectives that incorporate empirical evidence. Many papers see neuroscientific evidence as a key to expanding many areas of research. An electronic version of the book can be downloaded at the Evolang Website (although at the time of writing, the website was down). Below, I review the chapters to give a flavour of the book. Junko Kanero reviews vocal and gestural theories of language origins, and asks whether a vocalisation-only theory is testable. They suggest that recent advances in neuroscience will be able to test whether gestures and spoken language share common neural substrates. Cory Cuthebertson compares claims of abrupt versus gradual evolution of the language faculty in the proceedings of the first EvoLang conference in 1996 and the 2012 conference. They observe a broadening of approaches between the two, but theories have become less unified and the discussion of sudden versus gradual evolution has become much less explicit. Only two papers assumed an abrupt evolution of language. Xiaoxia Sun and Uwe Seifert discuss the origin of language and music, and whether they evolved separately, in sequence or together. They suggest that neuroscientific approach should also be able to differentiate between whether there were shared cognitive resources that served both language and music, but then split. They review existing neuroscience evidence and point out a gap in the literature: there should be more experiments with non-Western languages and musical styles. Tessa Verhoef reviews laboratory experiments of cultural evolution. Literature from computational neuroscience is used to suggest an integrating framework for studying cultural evolution and the brain by discussing compression and efficient coding. Seán Roberts and Justin Quillinan challenge the keynote lecture by Matsuzawa on working memories in chimpanzees. In a visual memory game, the chimpanzee Ayumu outperformed a small sample of humans. Roberts and Quillinan replicated the human study online and found participants who performed as well as Ayumu. Saccade distance and the fidelity of the ordering of numerals across the screen were predictors of performance. While no support was found for Hurfrod’s suggestion of a trade-off between auditory working memory and visual working memory, they suggest this could be tested in more detail in the future. Rie Asano contrasts studies which compare human cognition to animal cognition with studies which compare different human cognitive systems (e.g. language and music). 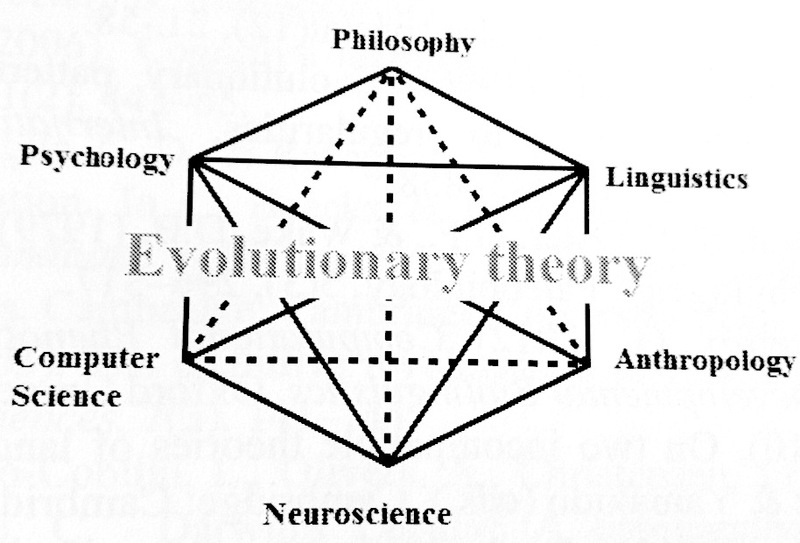 They argue that these address two separate domains –human uniqueness and language uniqueness, and this distinction should be incorporated into Hauser, Chomsky and Fitch’s distinction between FLN and FLB. Anne van der Kant reviews inter-species comparative work and suggests how non-invasive neuro-imaging can be applied to birds and primates to perform longitudinal studies of vocal learning. Caroline Green uses results reported at the 2012 EvoLang to hypothesise that FOXP2 mediates the relationship between finer auditory sensitivity and finer motor control of vocal production to allow vocal learning. They suggest an experiment that could elucidate this further. Michael Pleyer discusses views of language as a complex adaptive system, and notes that the ontogenetic, glossogenetic and phylogenetic elements are complex adaptive systems in their own right. They suggest that cognitive-functional and usage-based approaches can help synthesise these timescales by emphasising properties of language use and social factors. Marisa Delz and Johannes Wahle review studies of language evolution in networks from the conference. They synthesise the approaches under a single concept of embedded networks that they call Multiple-Network-Population. They suggest that it should be possible to compare and contrast studies that find social networks to be important for language evolution under a unified framework. Mauricio Martins, Archishman Raju and Andrea Ravignani review critical issues in quantitative modelling approaches to language evolution. They call for more rigorous scrutiny of assumptions in models and better validation against real data. Researchers in language evolution should learn from similar techniques in other fields. They suggest that quantitative modelling should be an intermediate step between theory and experiment. Lluís Barceló-Coblijn and Txuss Martin argue that approaches from evolutionary biology should be used to identify the unique aspects of language and study its evolution. Unlike the recent paper by Hauser et al., they see the best approach as involving the integration of many other disciplines such as anthropology, psychology, philosophy, neuroscience and modelling. Dillon Niederhut argues that neuroscience should be more central to the field. They review how methods in neuroscience can generate, constrain and test hypotheses of language evolution. Christian Bentz discusses how theories from the EvoLang conference could be unified into a cohesive picture. They present the concept of a ‘language helix’ which captures the idea of language as a complex adaptive system (similar to Pleyer) where regularities in language are constantly being inferred, ‘unfolded’ and inferred again at different levels and timescales. Richard Littauer, Seán Roberts, James Winters, Rachael Bailes, Michael Pleyer and Hannah Little provide a sociological review of the conference, and note the increasing role of technology. Participation of EvoLang 9 extended outside of Kyoto via the internet through twitter and blogging, and an increasing number of people were connected to the internet during talks, making it possible to fact-check claims immediately. They also discuss the role of blogging and academic publishing for the future of the field. 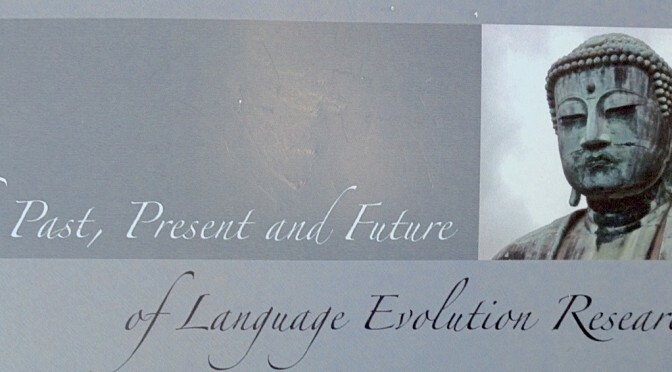 McCrohon, L., Thompson, B., Verhoef, T. and Yamauchi, H. (2014) The Past, Present and Future of Language Evolution Research: Student volume following the 9th International Conference on the Evolution of Language. Tokyo: EvoLang9 Organising Committee.